A lot of people have that “DIY” mentality. There are even TV shows based around Do It Yourself ideas like remodeling, crafting, gardening and much more. Why wouldn’t you do it yourself? It’s typically a lot cheaper, you can do it at your own pace, and you’ll feel accomplished once you’re done. However, not everything should be done yourself: dental braces are something you should always leave to a professional. Read on to find out the reasons why you should never do braces yourself from an expert dentist. There are many more materials people have tried using, but those listed above are the most common. 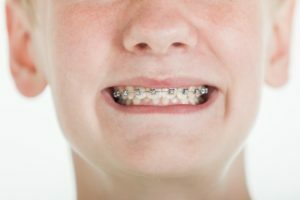 DIY braces have become popular because they are advertised as a cheap way to straighten your teeth, but their proponents haven’t considered the consequences. DIY braces tout fast results for straightened teeth, but quick adjustments have a greater chance of shifting back. Professional braces are designed to move the teeth small amounts over a long period of time creating lasting results. Because DIY braces can adjust your teeth a lot quicker than professional braces, there is a high chance that your smile will shift again after not using your homemade braces. Using other materials or rubber bands to adjust your smile quickly can be harmful to your teeth. Tight DIY braces actually restrict blood flow and cut your teeth and their roots off from the circulation they need to stay healthy. Using homemade braces can destroy your teeth and their roots if you use them for too long. In one of the more severe cases, a teenage girl used rubber bands as DIY braces and the rubber band dug into her gums, damaging her jawbone. Her dad spent almost $50,000 at the dentist to save her front two teeth. Because DIY braces are not medical grade, as well as nonsterile, its incredibly easy to develop an infection. Materials used for homemade braces cut into your gums, damaging your tissue and causing open sores that cannot heal until you stop wearing makeshift braces. Gum infection may just start with a little bleeding, but it can also lead to loss of teeth if it’s not tended to by a trusted dentist soon enough. DIY braces affect your entire mouth whether you want them to or not. Your jaw can unintentionally shift with your teeth, causing your lower and upper jaws to not fit together properly. This can affect the way you chew and even how you talk. One of the biggest reasons people DIY is to save money, but you could end up paying much more to repair damage caused to your mouth. Tooth replacement and surgery to address infections can be costly and inconvenient. You are much better off investing in professional braces rather than paying more money and potentially hurting your smile after DIY braces. Taking into consideration all the disadvantages of DIY braces, it’s vital that you avoid altering your smile without a professional. Visiting a dentist will ensure that you receive a safe and effective treatment plan and your teeth will be straightened effectively. Flenniken Family Dentistry has a team of 5 expert dentists that are ready to provide you with the personalized care that you need. We have various options for straightening teeth, and our Dr. Flenniken is a preferred provider of Invisalign in Carlisle. If you have any questions, we can be reached by phone at (717) 249-7777.